All kinds of drama in my house, but I'll write about that later. It's 1:00 p.m. in Florida in July and it's hot as hell and there are cars circling her, idling while she breathes in the car exhaust and fumes. And, I checked, this bank has handicap access to the lobby of the bank. Why would she not just go inside? It's so random. Six glasses. Steve had seen someone walking around our apartment that morning when he got home from work, and I was getting ready to leave. He went to the door but when he opened the door, there was no one there. 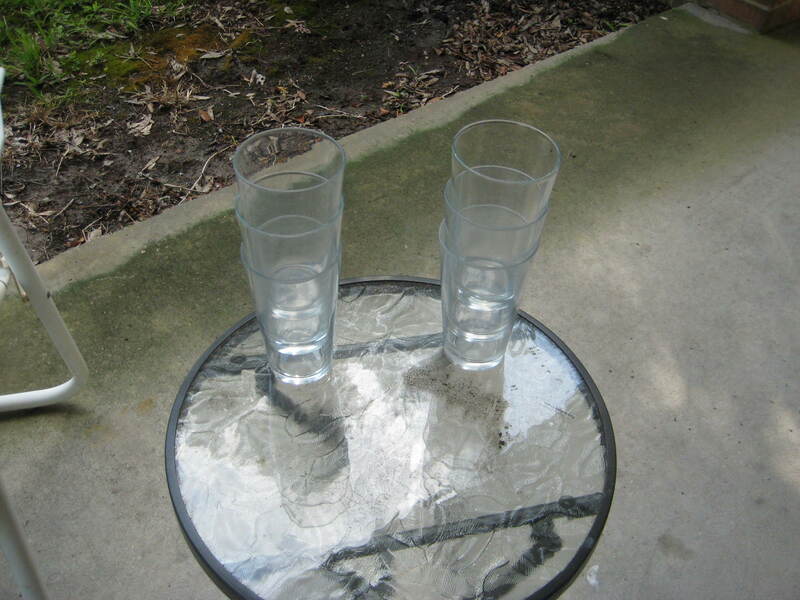 He surmised that the person who was walking around in the morning left the glasses there. I have no idea why. Steve thinks the guy was moving out and did not want to take his glasses. I know, it's a ridiculous theory. How could you not fit six glasses somewhere? This is so more than random; it's freaky weird. Before you ask, I did take the glasses inside and washed them and I plan to use them. What? They are nice glasses! 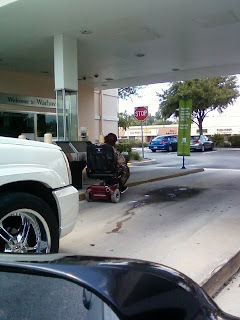 Suddenly, motorized wheelchair lady at the bank drive-through is looking pretty good next to me, right?